SF70BY 70mA Mobile X-ray Machine is a full-wave rectification photographic medical diagnosis machine whose tube head can take photos. 1. Type SF70A 70ma x-ray medical diagnostic equipment is full-wave rectification photographic medical diagnosis machine whose tube head can take photos. 2. It is suitable or x-ray photographing in wards and operation rooms is all hospitals as well as special hospitals, especially in orthopedic wards. It can also used for x-ray photographing in the family sickrooms. 3. Due to its adoption of high voltage silicon stack full wave rectification technology, the efficiency of the x-ray tube used in the machine is heightened. 4.This machine has a KV, mA, and S capacity interlocking control system, an overload indicating and overvoltage & under-voltage protective circuit so as to prevent the tube head of the machine from damaging due to the accident operation. 5. It has also a filament voltage stabilizing circuit high stability to stable the output x- ray does during photographing. 6.Either the wired manual exposure or the remote control exposure maybe be used by the technician at his selection during the photographing. 7.In the course of exposure, there will appear a sound and light indication for the convenience of patients and technicians. 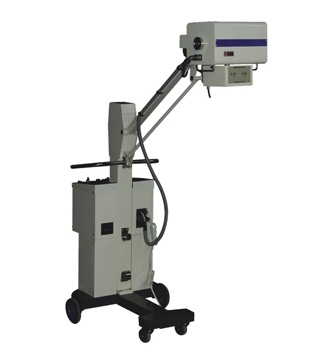 8.This x-ray equipment is equipped with an electric beam limiting device, on which there is an indicator indicating the ray beam aiming at the center of the xray film, the position of the focus center of the patient against the center of the xray film can thus be determined easily with reference to the indication. 9.This x-ray equipment is also provided with a tube head cantilever moving up and down. It is easily to set the tube head of the machine to required angle and height for the convenience of photographing. If it is necessary to move the whole machine, lower the machine tube head cantilever to its lowest position, and lock it up for the convenience and safety of machine movement. 10.The total weight of the x-ray equipment is 90kg, and easily to be moved with a light handcart ( 65 cm in width ) through the corridor in the ward of hospital and between hospital beds.